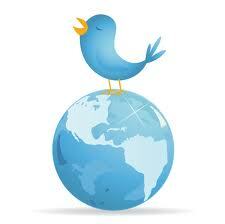 A change of scene does everyone the world of good – that’s why we all love to take holidays. And certain destinations lie at just the right point of latitude to offer warm sunshine and great light all year round, such as Lanzarote in the Canary Islands, which boasts similar co-ordinates to Mexico and Florida. This privileged position is what helps to make Lanzarote such a popular holiday destination – last year the island welcomed around 2 million tourists for both winter and summer sun holidays, many of whom were repeat visitors, as this small island seems to exert a magnetic pull. There’s certainly plenty to fall in love with here, not least Lanzarote’s amazing lunar landscapes which were forged during fiery eruptions in the 1730’s which decimated about one third of the island, leaving it buried beneath a sea of solid lava. In geological terms this is still a very recent event – so the lavascapes here remain pristine, especially as visitors are struictly prohibited from setting foot on them. 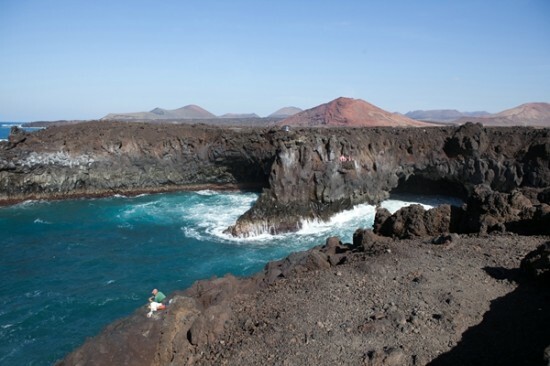 Instead, the best way to explore is to take a guided coach tour through the Timanfaya National Park, which is where the eruptions were concentrated. Here skilled drivers guide their vehicles through some of the most surreal scenery on the planet, whilst passengers gaze in awe at one of Mother Nature’s greatest recent works. Other lava flows are dotted across Lanzarote and in the north of the island there is still ample evidence of much earlier volcanic activity, such as in the malpais region in Ye and Orzola. This terrain is home to lots of caves and tunnels– and one of these huge cylinders is home to one of the most original visitor attractions around – the hugely impressive Jameos del Agua. Which was being used by locals as a rubbish dump until a local artist called Cesar Manrique seized on its potential in the late 1960’s, turning it into a huge tropical gardens and concert venue. 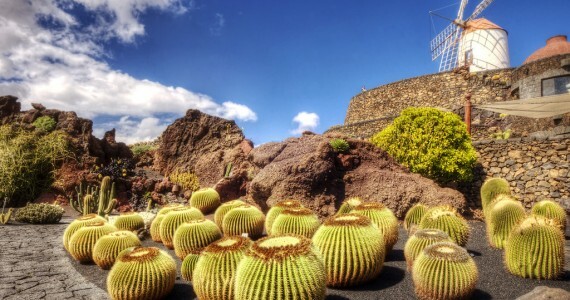 Manrique also weaved his magic in numerous other locations round the island, creating similarly iamagzintive attractions such as the Cactus Garden that also blend in effortlessly with the volcanic terrain. There are lots of good places to stay on the island with the bulk of the best hotels and apartment complexes concentrated within the confines of the three main holiday resorts. The trend towards DIY self catering breaks is also much in evidence, with visitors able to choose from a large selection of privately owned villas. The resort of Playa Blanca in the south has the highest concentration of this type of holiday accommodation and there are a number of local companies such as Optima Villas catering to this market. Check out Optima’s latest discounted deals to view their current special offers and prices. Best of all perhaps, Lanzarote is a real beach lovers paradise. There´s an estimated 80 plus beaches to explore and some of them are real show stoppers, most notably Papagayo, Famara and Arrieta. As Lanzarote is such a small island it is really easy to just hire a car and explore all of these picturesque playas in a couple of days.